Whether you are thinking about travelling with your fishing rods and reels or booking a fishing charter, such as Fish Happens, if saltwater is your destination, The Rod Glove has you protected. Chris started his career as a computer programmer but soon realized that he wanted to combine his passion for fishing with a full time career. He created the popular fishing guide service Fish Happens Outdoors, based in his hometown of Pensacola, Florida and now his office is a Blue Wave Pure Bay center console boat. Not only did Chris find time to fish as a business but he made time to compete in local and regional tournaments throughout the early 2000’s. 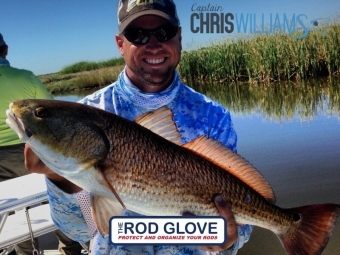 With his success as a tournament angler, he decided to jump into the world of professional tournament fishing and made a name for himself on the IFA Redfish Tour and the Louisiana Saltwater Series from 2007 to 2010. In 2010, Captain Chris was invited to join the ultra exclusive invitation only tour, the HT Redfish Series, which was filmed specifically for air on the Destination America Channel. In his rookie year Captain Chris was very successful with several top 15 and a top 10 appearances. Most recently Captain Chris has been featured on the Outdoor Channel, Penn's Big Water Adventures. Captain Chris Williams, is Pro Staff for The Rod Glove and has spent many hours out on the waters of Pensacola Bay, Florida, patterning, and targeting Redfish, Speckled Trout, and the occasional Flounder. He uses traditional spinning gear paired up with only the finest and most effective artificial lures on each fishing charter and the occasional live bait for when the fishing is slow. He also believes in protecting his saltwater rods and reels and uses The Rod Gloves and The Reel Gloves when travelling on his boat. Once he makes it back to shore from a days trip, he rinses all of his gear with freshwater. To learn more Captain Chris Williams please visit www.fishhappensoutdoors.com. I like to use the Rod Glove Pro Series as the neoprene protects my rods very well while travelling. I know that when I place them in the back of the truck they will be well protected.